As I mentioned, this was the closest thing I had seen to a true “laser beam”. When I tested it outdoors at night, a good portion of the beam was clearly visible due to moisture in the air. We compared it to another red laser of the same milliwatt output and close to nothing was visible. 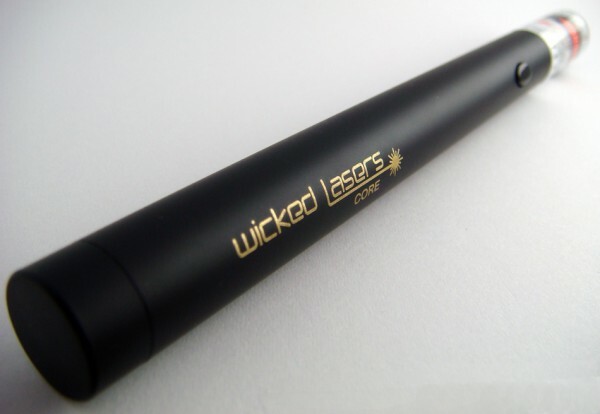 Although this is one of the least powerful green laser produced by Wicked Lasers, it is still quite dangerous. It is important to be cautious since direct exposure from close distances can permanently damage the eye. You will also find safety warnings on standard red laser pointers found in most office supply and electronic stores, but these aren’t nearly as dangerous or powerful. 15-35mW: beam visible at night, in smoke, and in foggy areas. Getting back to the Core model, it runs on two standard AAA batteries for up to 90 minutes. The lifespan of the laser itself is expected to be somewhere around 5,000 hours of use. The one small drawback we noticed was the fact that using this pointer for over 3 minutes continuously could cause the insides to overheat therefore sacrificing the laser diode’s lifespan. Either way 3 minutes is a pretty long time to be pointing at something, plus it’s a great improvement over older lasers which were even shorter. Red lasers are the most widely available, however green laser pointers are becoming much more common and cheaper. Just for a rough idea, just about 10 years ago a red laser would have cost nearly $100. 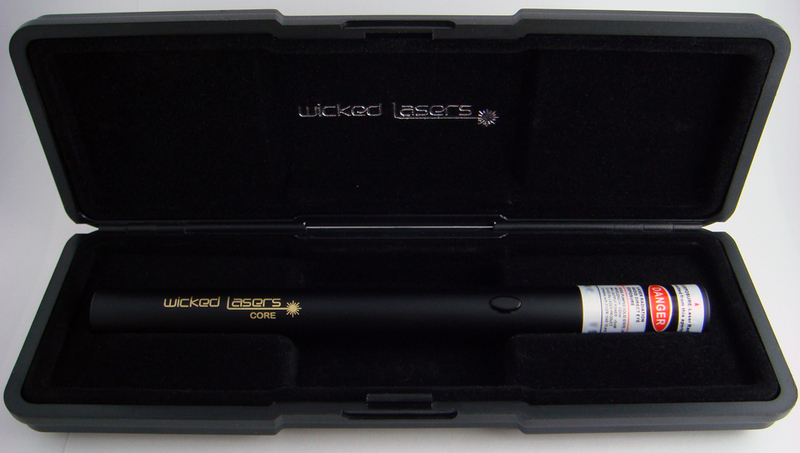 As for the CORE by Wicked Lasers, it is available online for just $35. Wicked Lasers even provides a 12 month warranty with the unit and throw in a hard case, so there’s not much to worry about. Having a green laser for presentations can make things more interesting. If you wish to purchase other higher end models, prices reach over $500. great. i just bought a red one. i think im going to order a green one off ebay. hopefully it looks cooler. its fun pointng it at birds and scaring them away lol plus my cat loves chasing the dots. DO NOT BUY LASERS FROM EBAY!!!! I was ripped $40 worth of laser pointers. They dont last, they kill batteries in under 20 mintutes, and they dont have IR filters. This CORE is worth the price (which is currently $30 btw). that would be amazing if you could see the laser line in normal daylight. im surpized these arn’t illegeal. couldn’t you start a fire from far far far away and no one would ever know??? its probably cool for science classes and stuff but i ‘d rather not burn down my dropdown screen with these. Yea nice im buying this one but even the high powered 55-300mw ones cant start fires from far away but only up close say under 50 feet at the max. The glass is very cute. don’t point them at birds! Try to see the lasers of mine!